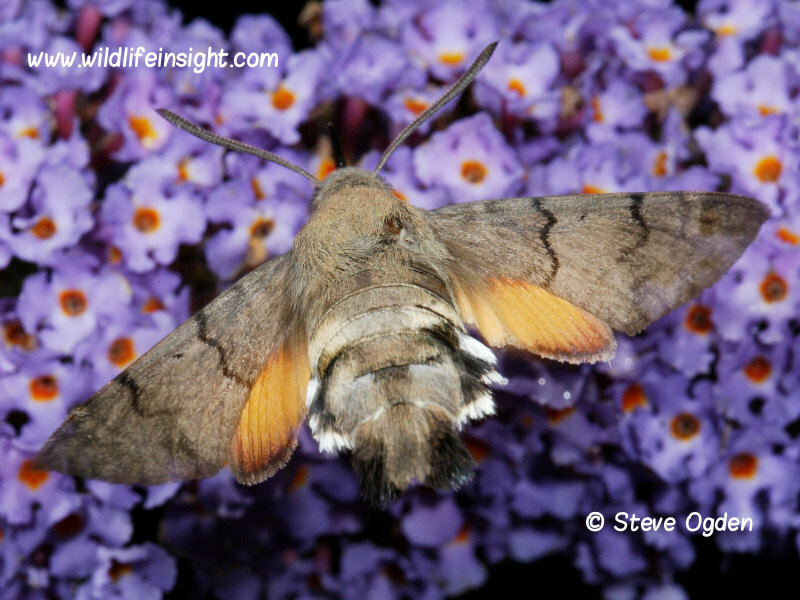 The Hummingbird Hawkmoth is an annual migrant to the British Isles in variable numbers with periodic large influxes depending on favourable migrating conditions. In strong migratory years they can frequently be seen in gardens and the open countryside as far north as Scotland but are more common in southern regions. As well as being attracted to a variety of flowers they can often be seen flying around bare rocky outcrops and sea cliffs. Their appearance around such exposed rocky features is a particularly common occurrence in south west Cornwall although the reason for this behaviour seems uncertain. 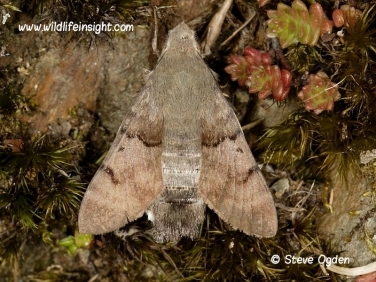 Despite being mainly diurnal small numbers are also attracted to light at night. 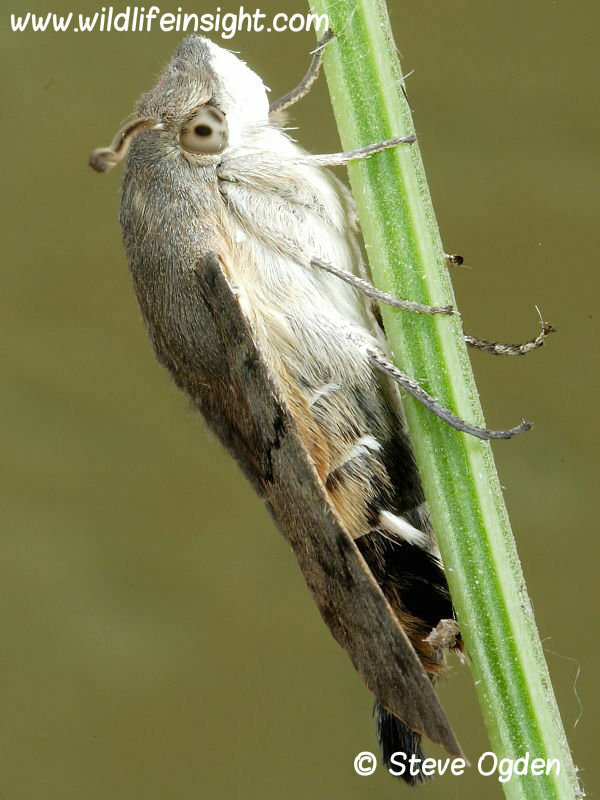 Hummingbird Hawkmoths have a wing span of up to 50mm and are most frequently seen flying during the day when they hover at flower heads to sip nectar. As their name suggests they resemble diminutive Hummingbirds and are unlikely to be confused with any other moth or butterfly in the British Isles. When hovering the Hummingbird Hawkmoth is reputed to beat its wings at up to 80 times a second and when doing so reveals orange underwings and black and white patches on the side of the abdomen. Occasionally they may be found settled on the ground with wings closed where they are easily over looked. 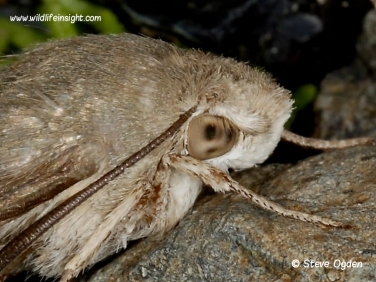 The Eyed Hawkmoth, The Poplar Hawkmoth and The Lime Hawkmoth. The first migrants generally arrive in late spring and early summer during warm weather and favourable winds emanating from continental Europe. 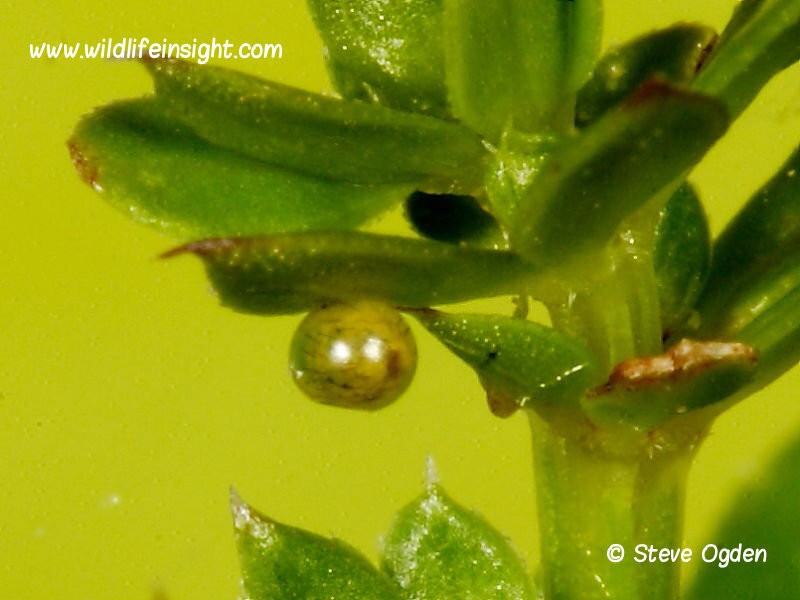 Females lay single eggs on species of Bedstraw that include Hedge Bedstraw, Lady’s Bedstraw and Wild Madder. Depending on temperature the eggs hatch within 7 and 14 days and the caterpillars are fully grown within 30 days. In warmer parts of Europe the adults are able to hibernate over winter in sheltered places. However, in northern regions, including the British Isles, the climate is too cold for them to normally survive. 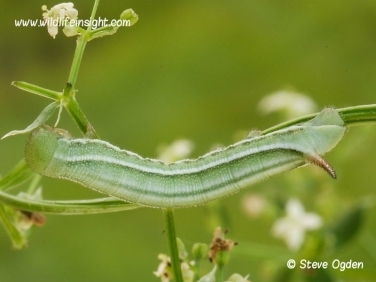 Although, a few records very early in the year suggest that a few occasionally may do so, perhaps in a garden shed or greenhouse. 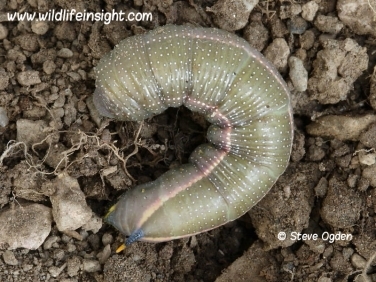 The caterpillars pupate just beneath the soil with the adult moth emerging in about 3 weeks. Caterpillars from eggs laid by late arriving migrants or the offspring of Spring arrivals may successfully pupate and the moths emerge but they are not thought to survive the winter. 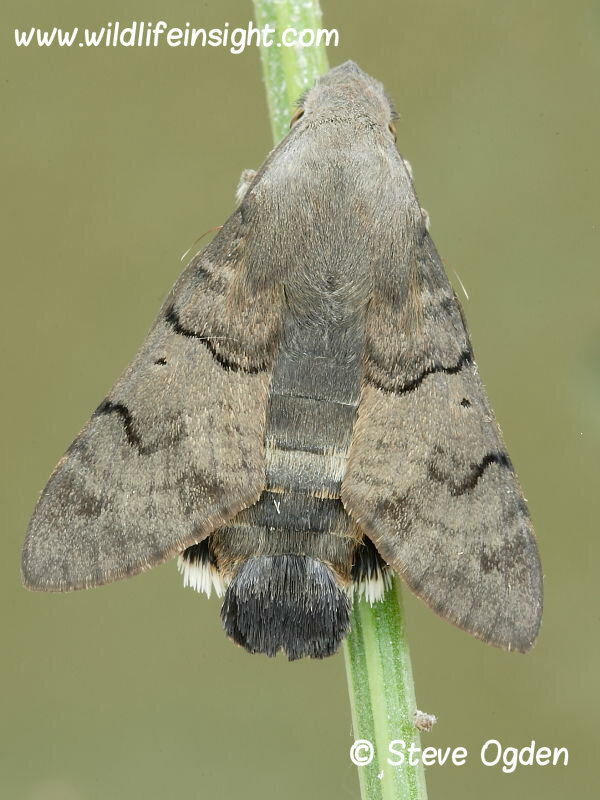 However, in recent years, some very early adult sightings have suggested that over wintering as either a moth or pupa may occur, perhaps in a protective place such as inside a green house or garden shed. 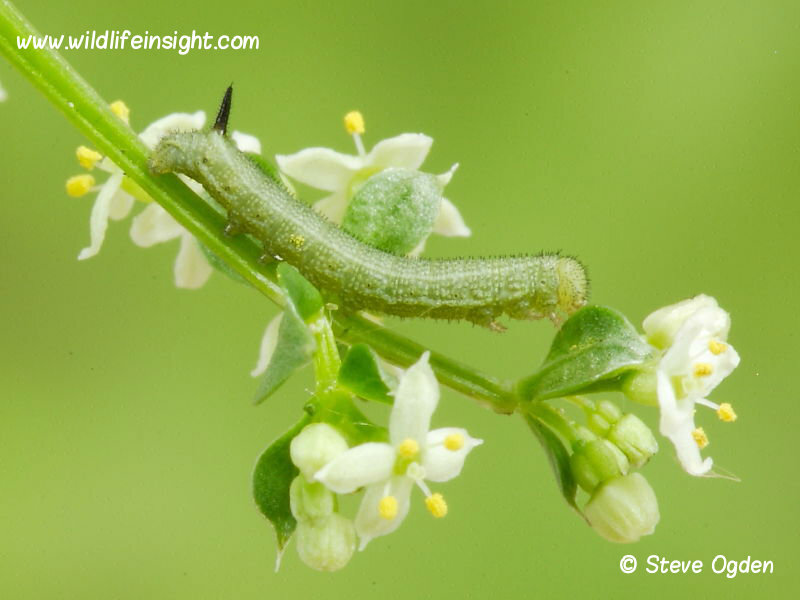 The following images are of Hummingbird Hawkmoth caterpillars reared from eggs collected from Hedge Bedstraw in Falmouth, Cornwall on 29th June 2014. 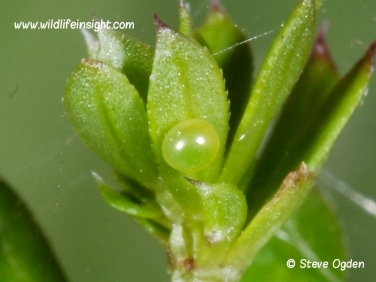 Within 5 days they’d all changed into a darker green instar with faint pale lines and were up to 7mm in length. 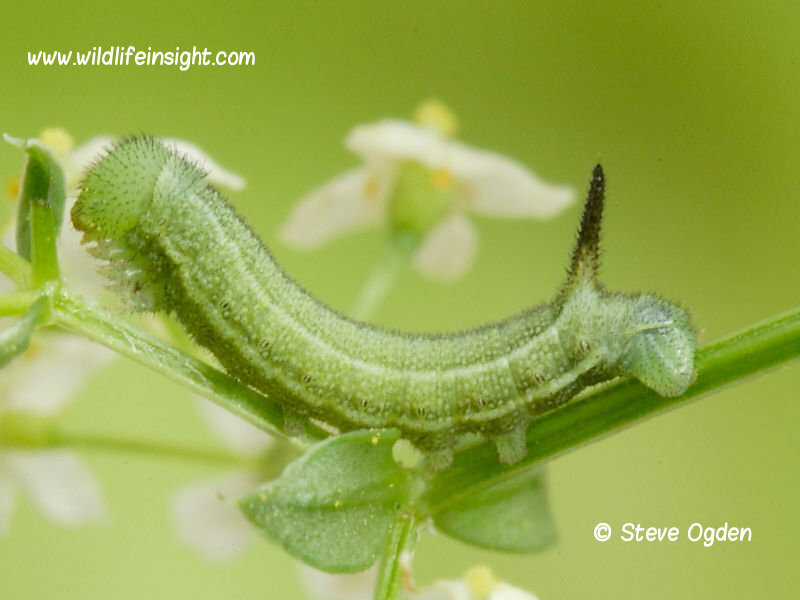 Within 14 days some had put on a dramatic growth spurt coinciding with a change of instar showing yellow tips to their tail horns. Within 17 days the fastest growing were between 40-45mm. Within 21 days several were between 50-55mm and fully grown. 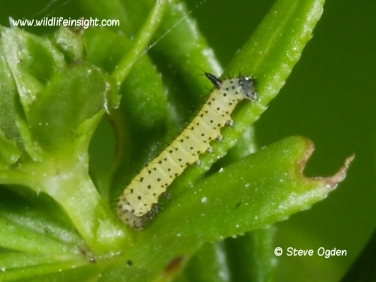 Within a few days of becoming fully grown the caterpillars stopped feeding and left the food plant. 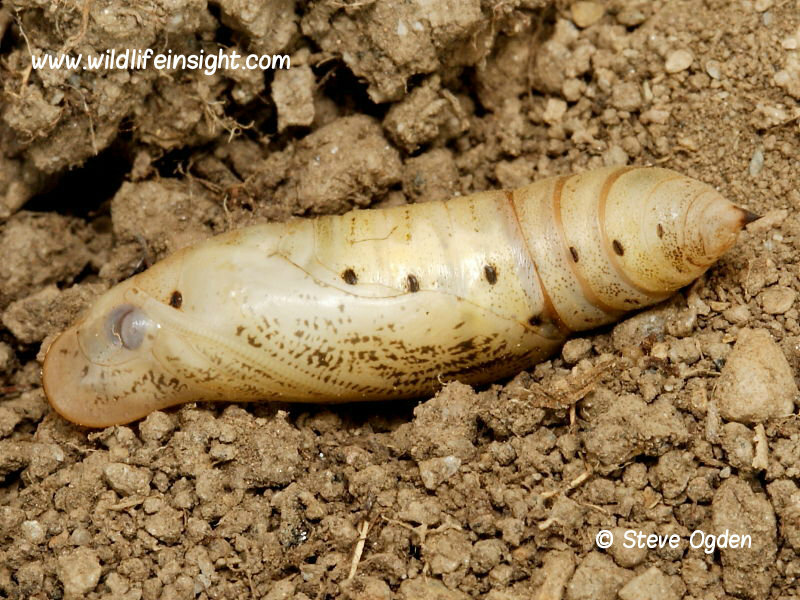 Over several days the pre pupating caterpillars turned progressively darker before burying themselves in the soil. The pupae were a much lighter colour than those of other species of Hawk-moth in the British Isles. 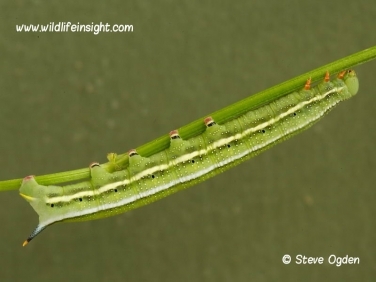 The brown form of the Hummingbird Hawkmoth caterpillar shown left was photographed by Reg Langston at Holkham in Norfolk. 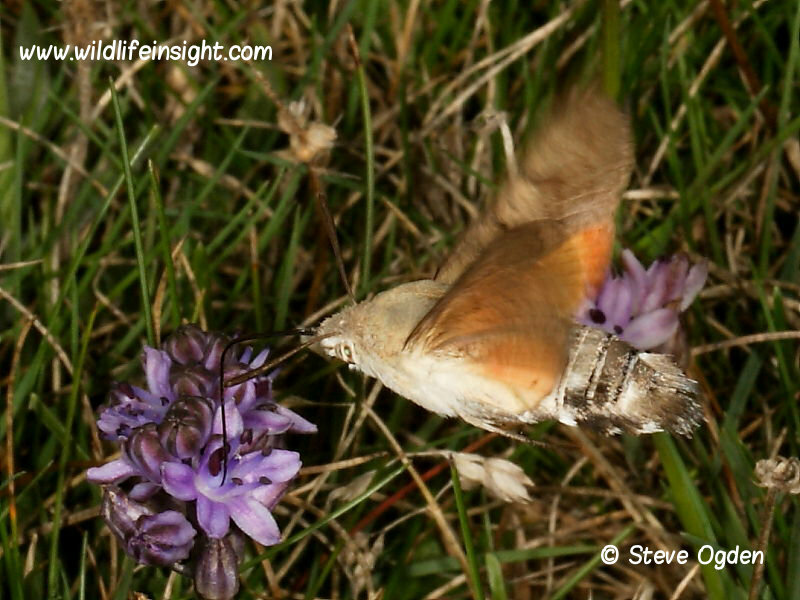 The Hummingbird Hawkmoths were easy to rear. Having observed a female laying on hedge bedstraw in the wild on the 17th June the eggs were easy to locate. Placing the bedstraw holding the eggs indoors in an oasis they hatched within 10 days. Larval food plant was replenished more frequently as the caterpillars increased in size. 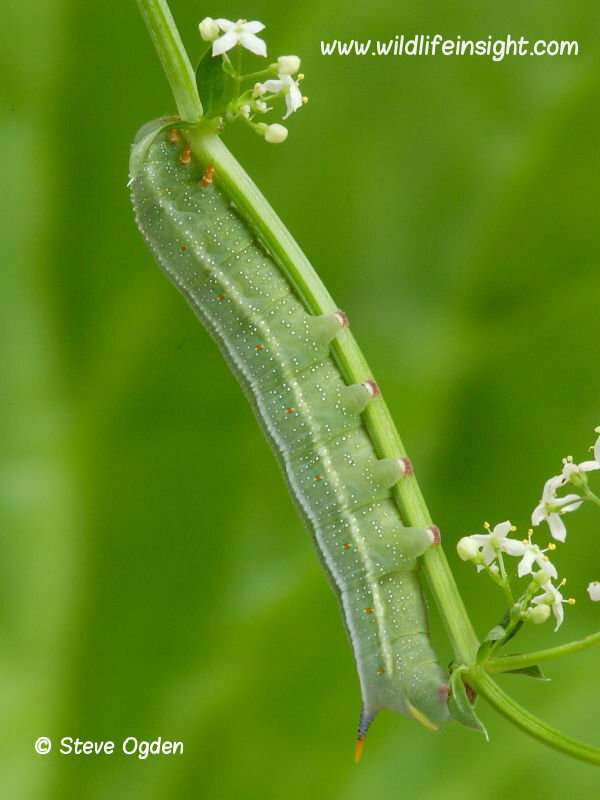 When fully grown and showing signs of pupating, a two inch layer of soil was introduced, into which the caterpillars buried themselves and pupated. Small sticks were placed close to the pupae for the emerging moths to climb up. In above average summer temperatures the moths emerged within 40-45 days of the eggs being collected. Hummingbird Hawk-moths feed on a wide variety of flowers. In Cornwall, around the coast and depending on time of year, they are often recorded on coastal Red Valerian and Autumn Squill and in more inland gardens on Lavender and Buddleia.